Skybridge night work over Post Road. A view of the Skywalk construction. Work at the TEI site. 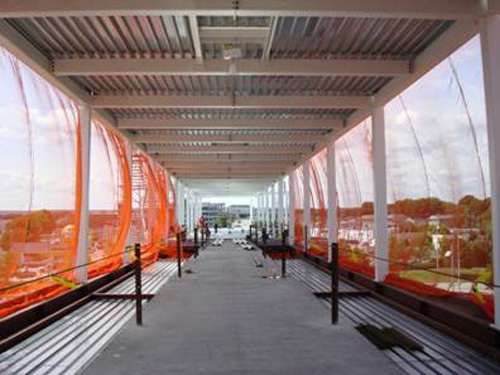 A view from the inside of the Skywalk, looking toward Post Road. Installation of paneling and sheathing at the CSO building. Pre-cast installation continues at the Garage site. The Intermodal Project is a collaborative effort of the Rhode Island Airport Corporation, working in partnership with the Rhode Island Department of Transportation, and the Federal Highway Administration. The $267 million transportation hub will allow MBTA commuter rail service to T.F. Green airport and Warwick, RI. This will be the closest rail line (1,570 feet) to a major airport terminal in the country. The project is broken into four major areas of construction – the Terminal End Improvements (TEI); the Skywalk; the customer service operations building (CSO) and the parking garage and fueling platforms. These four major components of the Intermodal project are being built concurrently. 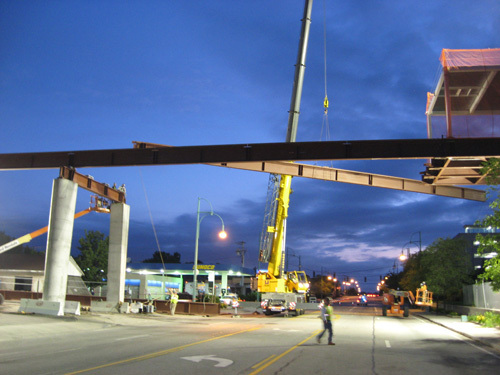 The project continues to move forward at a steady pace with the Skywalk structure crossing over Post Road. Next steps for construction include the connection of the Skywalk to the CSO structure sometime in July. There are no plans for additional road closures in the near future, however there may be some night work and therefore lane restrictions near the Airport’s departure and commercial roadways. TEI steel is 100% complete. Fireproofing is complete except for column work and intumesce white paint that will cover the spray fireproofing. Storm drains and safety divots are being installed. Demolition of existing masonry block took place during the last week of June on the 1st and 2nd floors of the terminal. Overnight work on the Skywalk took place in mid-June. 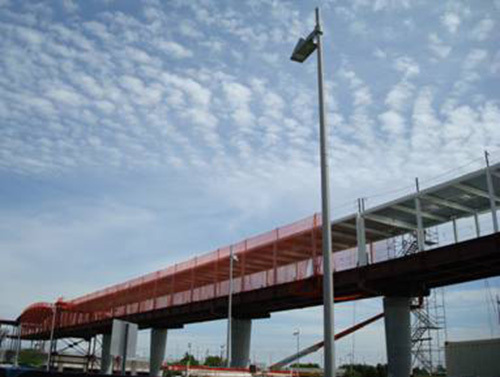 The Skywalk steel erection has crossed Post Road and steelwork is now more than 50% complete. Detailing work continues including installing hangers and conduits above and between piers. Temporary scaffolding has been built for workers to more easily access the skywalk. The permanent stair tower, at what is known as the “knuckle,” has been constructed and allows for emergency egress only. Work to install parapet walls on the Skywalk roof began this month. The placement of plywood, densglass and Styrofoam will follow. 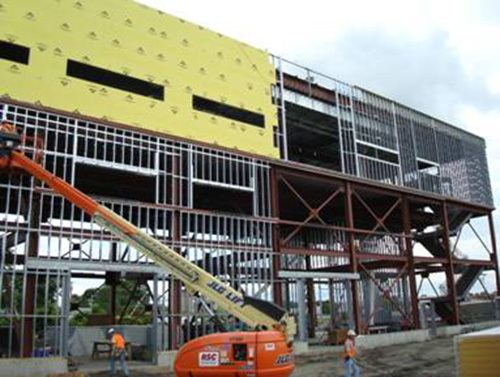 Exterior building envelope work is taking place with installation of metal panels, sheathing, and insulation panels. 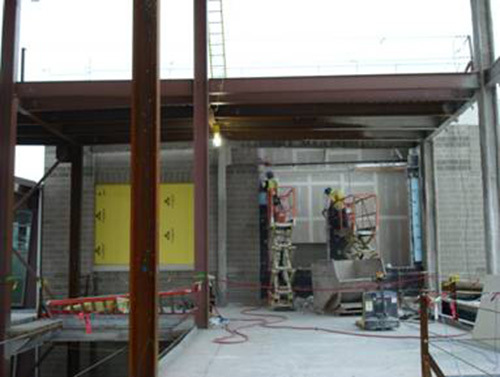 Installation of interior metal panels has begun at the first floor level. Major mechanical work including installation of the sewer line, storm drains, sanitary sections and cooling tower pipes are all complete. Installation of the CSO roof is schedule to start in mid July. Installation of the sprinkler system is near complete. Storm drains are now finished. 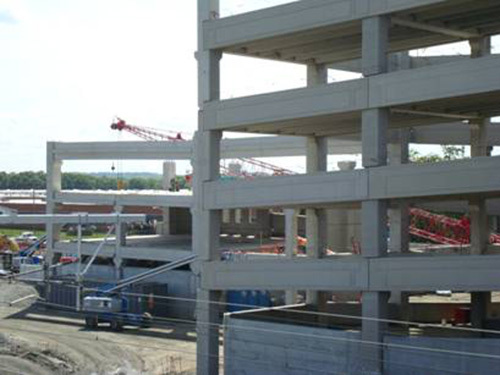 Approximately 1,130 of the 3,400 pieces of pre-cast concrete for the garage and fueling platform have been placed. Detailing of precast concrete sections is ongoing with welding connections and caulking joints. Installation of the car wash reclamation tank is finished and drains and system connections have been placed. Reinforcing steel is ready for precast concrete curb to be placed on all floors of the facility. Backfilling of precast columns is nearly finished. Excavation for underground drainage at the fueling platform has been finished and installation of sewer and other drainage has started. The cast-in-place foundations for stair and elevator towers are being poured. The precast concrete erection continues from the north end moving toward the south. All pile cap footings are complete. Concrete ramp walls, shear walls, and the garage parameter walls are ongoing. Back filling of perimeter walls continues. The north ramp foundations in the east garage have been poured. The southern ramp is scheduled to be poured in late June. Unfortunately, gcpvd has fallen for the latest urban legend around these parts: that trains are coming to the Warwick Intermodal Train Station. Back while the snow was still on the ground, our Rhode Island general assembly decided that it could not afford to move forward with the financing that Amtrak requires to fund this project. Check out the Fiscal Year 2010 Rhode Island budget. There is no provision in it for the Public Rail Corporation of Rhode Island. Unless the Rhode Island Airport Corporation sees the wisdom in freeing up some of its $200 million in cash reserves, much of which is unallocated to any project, no trains will ever stop at the Intermodal. You see, they are building a train station without trains.